The AfriOceans Warriors GOAL message: to have a cleaner, protected coastline, and save our oceans!What an amazing event we had yesterday in celebration of World Oceans Day and in line with the FIFA World Cup, which is being celebrated nationally! 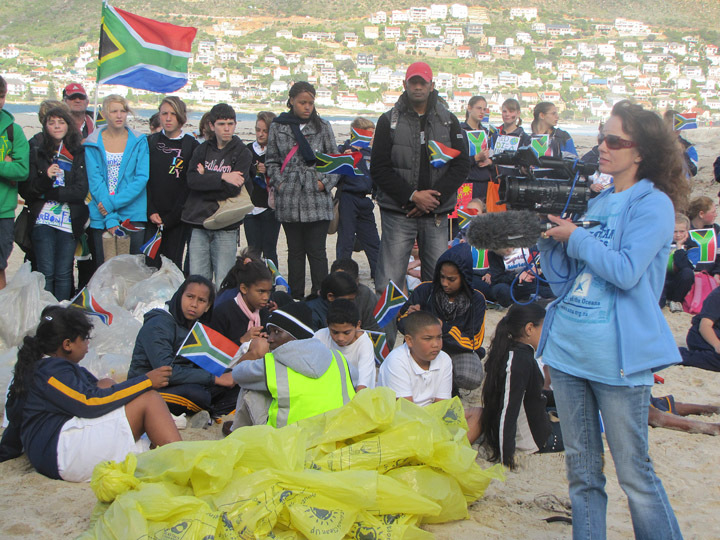 Our AfriOceans Warriors Environmental Education Programme, an initiative of the AfriOceans Conservation Alliance, teamed up with the City of Cape Town’s ‘Operation Green’, a FIFA World Cup Green Goal project, and arranged a coastal clean-up. 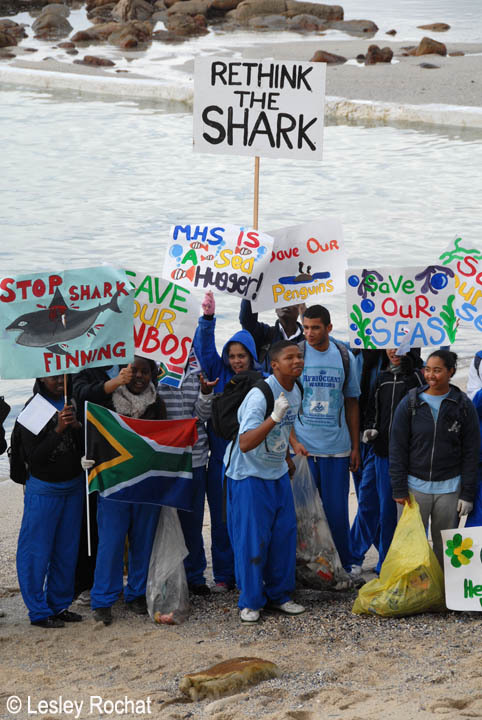 About 150 young South African learners from seven schools, led by a group of the AfriOceans Warriors from Muizenberg High School, picked up litter along a 7 kilometer stretch of our coastline between Muizenberg Beach and Fish Hoek Beach. This activity helped to raise awareness about how litter is harming our ocean environment, but also how we can all make a difference in changing that. Over 100 bags of waste were collected, audited and sorted, and more than 60% of the waste will be recycled. 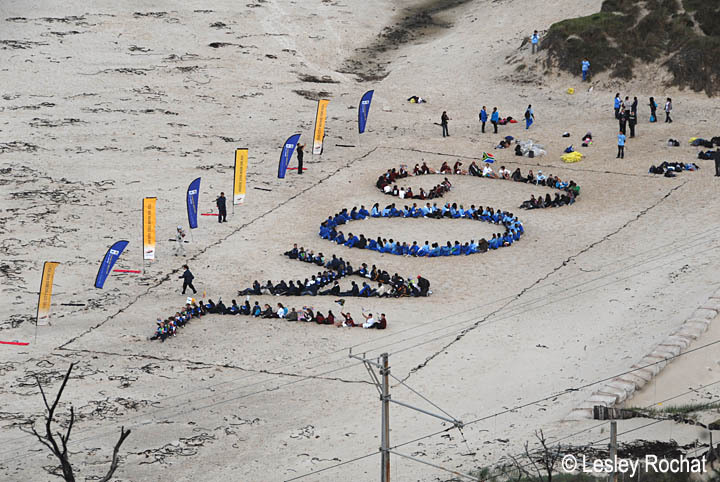 A highlight of this event was the symbolic word ‘GOAL’ that the young AfriOceans Warriors formed on the beach, symbolic of their goal for a cleaner ocean environment, and which was photographed from the mountain above Clovelly. City of Cape Town Mayoral Committee member, Clive Justus, implored the children to act for their environment everyday and told them to always remember the slogan, ‘I can and I will’. Lorraine Gerans of the City of Cape Town Green Goal Initiative was delighted with the cleanup and said it would help in reducing the ecological footprint of the FIFA World Cup. I was particularly proud of the AfriOceans Warriors who walked from Muizenberg surfers corner with their protest boards, chanting phrases such as ‘save our whales, save our seas, stop pollution!’. It was a very exciting event to be part of: I drove ahead to position myself to film them at various points, or hung out the car filming them on the move and ran up the mountain to photograph their GOAL formation. I even squeezed in a live radio interview with Jeff Ayliffe of Cape Talk after nearly being hit by a train! (I had to hop over the railway line a few times to reach them on the beaches). When they got to Kalk Bay, cars drove past them hooting in support, and they chanted ever louder with Terry Corr, Head of AfriOceans Education, leading them proudly. It had always been our goal to get the AfriOceans Warriors into the World Cup and now we are here, sending an important message to the world once again. I am extremely proud of the AfriOceans Warriors, and the AfriOceans Warriors Vuvuzela Ensemble who played at the event, and of all the learners from the following schools who participated: Muizenberg High School, Muizenberg, Muizenberg Junior School, Muizenberg Centre of Science and Technology (COSAT), Khayelitsha, Fish Hoek High School, Fish Hoek Junior School, Paul Greyling Primer Skool, and Kleinberg Primary School. A big thank you to all of you! A very special thanks goes to Terry Corr who must remain one of the most passionate environmental educators I know, and to Leonie Jacobson, the dynamic Deputy Headmaster of Muizenberg High, our partner in this AfriOceans Warriors initiative, and to Noel Johannssen, for all their effort that went into organising the meaningful event. And a thanks to Michael Carnegie who with his artistic eye helped Terry to lay out the formation. 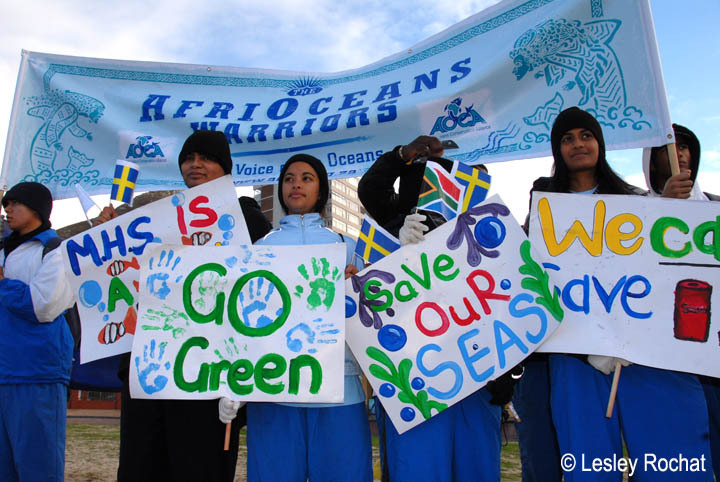 The AfriOceans Warriors Programme was launched in December 2009 when over 430 learners from 13 schools hiked along a stretch of the coast with the aim of raising both national and international awareness about the plight of our oceans. Forming symbolic messages on the beach has become their trademark and way to spread their message, and at this previous event they formed a massive S.O.S. Fantastic initiative, we need to see more of this in South Africa and all over the world, well done to AfriOcean oceans warriors and the team! This is way more important than World Cups! Wow! Lesley, what an amazing first hand report of the Operation Green Coastal Cleanup and the lengths that you went to to get the best shots. It was probably the most memorable moment in my environmental education journey What i witnessed and experienced first hand on Wednesday was 150 school children from all over Cape Town become one Tribe. Just like that! They joined hands together to help our Oceans whilst empowering themselves to take responsible, informed action. Led by our AfriOceans Warriors Muizenberg Tribe leaders, walking through Kalk Bay singing ‘Save our Sharks’ slogans, blowing vuvuzelas and waving our SA flags, the whole procession took on its own natural energy and passion and the response from passerbys was phenomenal. When we met Paul Greyling school at the kalk Bay Harbour, the young AfriOceans Warriors came running to join in and immediately created more energy as we surged towards Clovelly. It is that energy that we have available to nuture, develop and set free. We have created the platform for our youth to voice their concerns and offer their solutions. You are an inspiration, Lesley! It is quite uncommon to see so much energy and dedication activated for a worthy cause. You simply rock! !